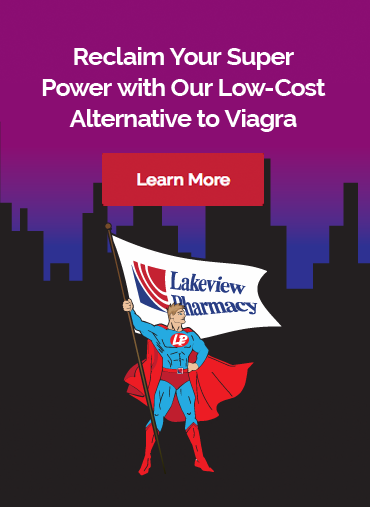 Lakeview Pharmacy now offers Sildenafil for your furry friends at a fraction of the cost of the leading brands such as Revatio. If your dog has heart and lung issues and needs a custom dose or has problems taking medications, we can compound any dose into a tasty dog treat at a low cost. Sildenafil’s effect on the pulmonary vasculature makes the drug useful in treating dogs. In dogs, the drug is most often prescribed to treat heart and lung problems, including pulmonary hypertension resulting from heart failure, pulmonary abnormalities, and cardiac abnormalities. Sildenafil relaxes the lungs, which allows blood to flow more readily, and decreases stress on the heart. Some dogs have experienced flushed or red skin and digestive distress while under treatment with Sildenafil. In the event of accidental overdose, contact your veterinarian immediately. Sildenafil should be kept out of reach of children, and should only be administered to the dog for which it was prescribed. This medication should not be given to dogs suffering from shock, blood loss, or low blood pressure, and should not be used with drugs that lower blood pressure, including but not limited to nitrates, amlodipine, and nitroprusside sodium. The drugs cimetidine, rifampin, phenobarbital, itraconazole erythromycin, clarithromycin, and ketoconazole may also cause undesirable drug interactions when given in concert with Sildenafil. How Can We Help You & Your Dog? Our expert compounding pharmacist, Debbie LoCurto Rph, recently completed a certificate program of Veterinary Compounding Essentials put on by the American College of Veterinary Pharmacists. Debbie is able to assist you with any of your veterinary compounding needs. We are able to compound many medications into treats or topical applications to increase compliance and ease the administration for your patients and pet owners. For additional information about Sildenafil for dogs and a custom quote, please call us at 800-852-1445 or email debbie@lakeviewpharmacy.com.